While it might not be the hot topic it was a few years ago, SEO, or search engine optimisation, is still a crucial consideration for all websites. If you want traffic, then your site needs to be optimised, your social media presence needs to be optimised, your content marketing efforts need to be optimised and more. However, the rise of big data has made things even more difficult for business owners. Thankfully, data science can help. How does it affect SEO? Actually, there are several key considerations here. Inbound linking is a vital part of SEO, but it can be difficult to tell which partners are worth your time and which are not. It’s about more than just the page rank of the link host, too. It’s about the amount and quality of the traffic you receive from that link. It can be an incredible challenge to sort through a year or two of inbound link traffic and user actions to manually determine which link partners are high quality. Data science can simplify this and help ensure that you’re forming the relationships needed for growth. The humble keyword remains one of the most crucial considerations when it comes to SEO. However, you can bet that your competitors are targeting the same keywords and key phrases. You can get a jump on them and improve your competitiveness by using data science to compare performance for different keywords and key phrases. Doing this manually would be a nightmare, but by using data science to dig into big data regarding keywords, you can ensure that you see what your competitors are doing, and then do it better, or even find an alternative that offers better traction with online searchers and less competition. It can be difficult to know exactly what you should do with your website architecture, social media and other outreach options. By comparing your performance to that of your competitors, you can learn from both their successes and their mistakes, and streamline your own efforts. Data science makes it simpler to analyse the performance of competitors positioned both above and below you in the SERPs, identify what they’re doing right and wrong, and then make any needed changes to your business. A recent data science study found that 70% of users encountering content that had not been correctly optimised when visiting a website opted out – they bounced to a competitor. By using data science, you too can drill down into your content to ensure that it’s optimised correctly for your audience. 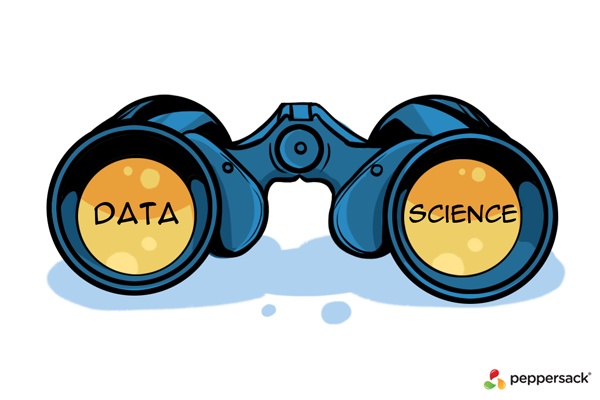 These are just a few of the ways that data science can affect both on-page and off-page SEO. At Peppersack, we’re driven to provide our clients with end-to-end solutions that help them grow their business, including big data and data science. We invite you to get in touch today to learn more about how we can enhance your competitive edge.